It is probably best to remind readers of the Eurostar product. 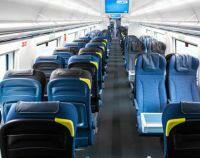 As used on the Amsterdam service, Eurostar's new e320 trains can carry up to 902 travellers in 16 interconnected coaches, twice the number of an A380 and a great deal more even than easyJet’s latest new A321 neo (see BTN 23 July). There are no seat belts to fasten, plenty of legroom and no cramped aisle. There is free wi-fi. With the railway, you can take more or less unlimited luggage but there are a couple of steps to climb getting on board, the high flooring level being difficult for some. There are Eurostar staff around to help. On a non-airbridge flight, it can be far worse. The airlines do not encourage hand luggage and large items can go in the hold, usually at a cost. With the train, travellers have no choice but to drag their baggage along. And there is often lots of it, meaning you have to struggle avoiding colliding with other passengers. Or you can use AirPortr and the like, a luggage service, but that does have a cost implication. 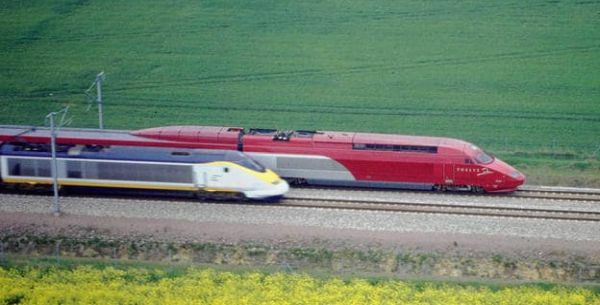 Eurostar has three classes. 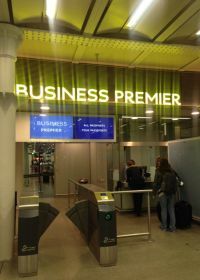 Business Premier is a full-service product including dining, with a 10min priority check-in and use of a lounge at all stations served by the Anglo-French operator. It is a fully flexible ticket. Seating ranges from singleton to a four-seat layout ideal for an on-board meeting. Check-in opens from 90min before departure, giving plenty of time to use the lounge or the new Chop-Chop hair boutique and World Duty Free. Chop-Chop offers a menu of 24 styles, delivered in 20min at a single price point of £20 regardless of gender or hair type. Both facilities are open to all. Other benefits include a taxi booking facility. 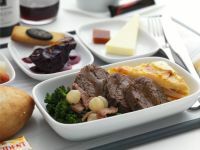 Since it competes with the limited Business Class service offered by Air France, British Airways and KLM, the fact that you board with everyone else is of little consequence. It is the same with the airlines. Unlike long-haul air routes with a front door, all passengers on short-haul European flights enter by the same door and queue together. Business Premier is an executive carriage away from the busy part of the train but it can be a long platform walk depending on the particular service. For Paris travellers, Eurostar last year opened an impressive new Business Premier lounge at Gare du Nord in what was once the station hotel. As with the on-board consumption, Michelin-rated chef Raymond Blanc has been much involved. The London lounge is less sumptuous, and likewise the fayre. Business Standard has a small premium in cost over Standard, a similar seating arrangement to Business Premier with a light meal served at your seat. There are no special arrangements for joining the service nor use of the lounge. Standard Class is 2+2, very comfortable, with USB and power connections as per the rest of the train. Travellers needing refreshments are served by two catering units and depending on the time these can be busy and quite a walk; the prices are reasonable. With Standard Class (and Business Standard), you can be subject to a very long queue at St Pancras which does move quickly. It can be demoralising and tiring. Plan to arrive 60min before departure, but half an hour works too if you are brave enough. Getting through security is easy, but once again Border Control can be sheer purgatory, with both French and British officers dealing with all nationalities intermingled between the several lines. The real problem is not enough space. This area was once occupied by horse-drawn drays when the beer came in from Burton! Not an easy problem to solve. The queue looks daunting, with 900 people in a crocodile file. It would be better to have some seating and for people to be called up to board by carriage number. Eurostar services began on 14 November 1994 between Waterloo International station in London, Gare du Nord in Paris and Brussels. Exactly 13 years later, the London gateway transferred from Waterloo to the extended and extensively refurbished St Pancras International Station adjoining Kings Cross. 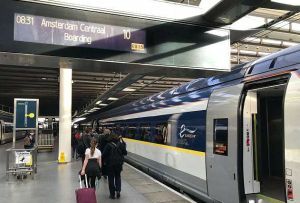 With Euston just down the road, connections to central England are very good and Eurostar quickly destroyed the once-lucrative air routes between the London airports and both Paris and Brussels. Taking London City Airport as an example, you cannot now fly between LCY and Brussels, and to Paris from the downtown airport is limited to three regional jet flights to Orly. In February this year, Eurostar instigated direct services to Amsterdam (and Rotterdam) from St Pancras and soon introduced its new redesigned Siemens E320 units. From Ashford you need to change at Brussels. Schengen Zone border control procedures are at the UK departing points and the journey time to the very popular Dutch city is 3hr 41min. For the return journey it was deemed not practical to set up controls at Amsterdam and Rotterdam and so travellers (and their bags) have to get off what is a Thalys train at Brussels and find their way to the immigration facility within that station and back on to a genuine Eurostar product. When the train is full, the 1hr changeover can be tight. There is a lounge for Business Premier. 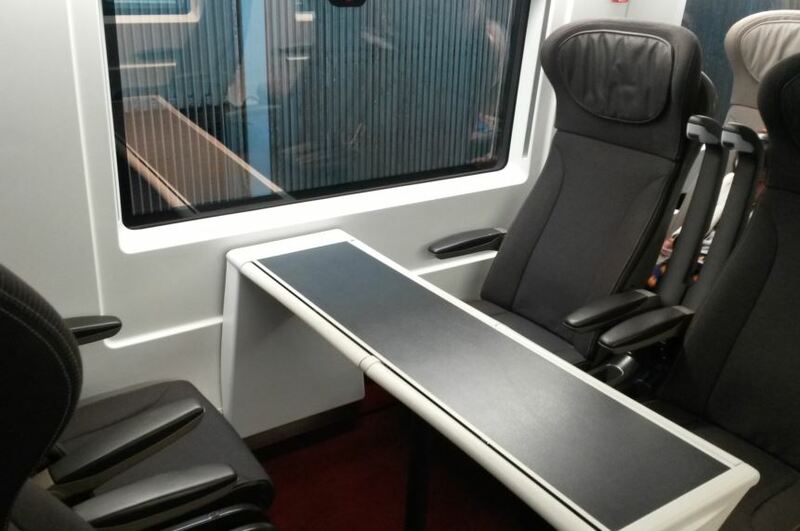 Amsterdam to Brussels was a first time on Thalys for BTN, and we were impressed. Comfortable seating and a very smooth ride. Going by rail to Paris is now the accepted way. With Eurostar, what size and weight restrictions there are for luggage are generally not enforced and the security is of a nominal variety, looking for sharp objects. There are both body and luggage scanners. It is a relaxed service. Amsterdam, while already a success, has some disadvantages. The return journey means getting off the train with luggage and struggling through Brussels station. Not much fun and a journey time 1hr longer. Prices are high for the most part, with Eurostar not in charge of the Thalys leg. Which is best? Train or air. Essentially it depends where your starting point is, and to a lesser extent where you are going at the other end. Comparing like for like, the check-in at St Pancras can be wearisome, the staff very helpful, but overwhelmed, France-bound travellers also attempting to do the same thing. The cost difference plays an important role in one choice too. Using BTN’s north London Edgware office as a starting point, here is a list of London departure points and suggested travel times. OAG shows the flight time from 1hr, with certain Southend flights, to 90min from Heathrow, half as long again. But in truth it is luck as Schiphol to Luton can be 45min and a quick Border Control, and the same airport twice as long with apron delays and slow agents. Add 45min from touchdown at Schiphol to Amsterdam Central on the excellent Metro. We took Sunday 21 October (Trafalgar Day) using www.skyscanner.net as our booking agent and came up with the prices noted. On other days, there are cheaper flights and typically with easyJet a multitude of frequencies with some timings a great deal more expensive. All the airlines offered free hand luggage, some more generous than others. 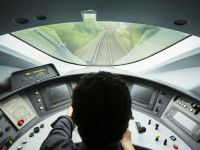 With Eurostar, the outbound was £35 Standard Class, £79 Standard Premier and £260 Business Premier. For whatever reason, the return train fare was considerably more expensive. KLM Business Class from Heathrow starts at £321. Southend has flights on offer for September for as little as £20.21 outbound, including the massive APD charge, and a return of £11.25. By way of a summary, it depends on your starting point, remembering that Amsterdam has only two daily direct train services. From a central London location, St Pancras wins every time, unless speed and frequent services are your criteria, with LCY clearly your departure point in that case. From certain parts of East London/Essex, either Southend or Stansted are the best. Heathrow is quickest from the west with a choice of airlines and terminals, and should your location be in the South East suburbs and Kent, it is Ashford. Gatwick has its own catchment area. I recently used the Eurostar service from Avignon to London. I found the 1.5 hour passport and security screening process at Lille to be time wasting and whilst I wouldn't describe it as a 'killer', it is pretty unpleasant. You do re-board the same train. Amsterdam to London immigration process a killer for the new service and not even on the same train. Someone needs to figure this out pronto.